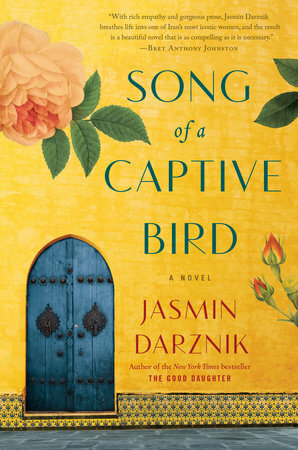 The following is from Jasmin Darznik's novel, Song of a Captive Bird. 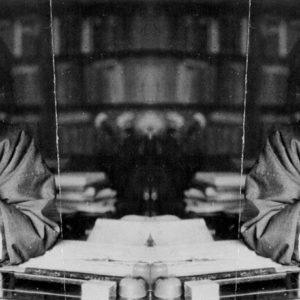 Forugh Farrokhzad grew up a rebel, fighting the notion that young girls should be quiet and modest. This fictional account of the poet's life recounts her long and twisting past to national acclaim. Jasmin Darznik is the author of New York Times bestseller The Good Daughter: A Memoir of My Mother's Hidden Life. Song of a Captive Bird is her first novel. and the murderous thirst of their hands. June of that year was a month of martyrs and bloody days. In answer to the cries of “Down with the shah!” and “Down with imperialism!” the holy city of Qom had been set ablaze. Seminary students were shot dead in the streets; clerical robes and religious texts were heaped onto bonfires; minarets and golden domes were turned to ash. In Tehran, pictures of a cleric named Khomeini were papered in every corner of the central bazaar. That was the first time most Iranians had heard of him, but in sixteen years he would lead the country into revolution and Iran would become an Islamic republic. A year after that, the shah would be dead. It seemed impossible, back then, to trace the machinations of kings, presidents, and politicians to an obscure cleric, but those three days of bloody riots presaged all that would come. “I can summon a million martyrs,” Khomeini said, and the first several thousand came forth now. It was Ashura, the annual day of mourning for the beloved Imam Hossein. Incensed by the regime’s assaults on Qom and emboldened by memories of Imam Hossein’s martyrdom, men flooded the streets, slashing chains against their bare chests. In the city, I heard them. They marched until their bodies were ripe with gashes and the streets were stained with their blood. The fires, the murders, the riots, the marches—all seemed part of some progression. Every death was telling some part of our story, which was Iran’s story, but no one could tell how the story would end. We were driven by forces we didn’t understand, moving toward a destination we couldn’t see. Those were bitter and black days, full of prophecy and dread, and every face seemed disfigured by grief, confusion, and rage. I remember those days, and the months that followed. The secret police and government informers were everywhere, their numbers ever increasing. When you heard they were eight thousand strong—twenty thousand, sixty thousand—you thought, impossible. How could the estimates vary so wildly? But that was the point. Not knowing how many there were, we imagined them everywhere. They might be anyone, everyone. Mullahs were rounded up, imprisoned or exiled. Leftists, with whom the religious right shared little apart from their hatred of the monarchy, met the same fate. A playwright I knew disappeared and was found dead weeks later at the edge of the Salt Desert. Books were censored, and newspaper after newspaper shut down. Any mention of democracy or social justice was deemed subversive. Treasonous. People scattered into the countryside or left the country altogether. In prison cells and dark basements, in warehouses and along stretches of barren roads, there were bodies that would never be claimed or tended or buried. We would never witness those tortures and deaths, nor read or hear of them, but they were there, in our silence and our fear. One afternoon, as I was making my way back to my car from a bookstore near Tehran University, where I’d spent most of the morning, I noticed that a large number of students had gathered near the university gates. Between the protesters and the onlookers I guessed there were about three hundred people in the crowd. There were still scattered protests about town, watched over by phalanxes of heavily armed security forces, but a gathering this large was unusual enough to make me stop and stare. “Our oil is ours!” the students chanted. “Death to the dictator!” and “Democracy for Iran!” I pushed past the onlookers and managed to read the demands inscribed on their posters: political reform, greater civil rights, freedom of expression. A young man in an olive-green canvas jacket and longish hair had made his way onto a sort of platform. The crowd seemed to know him. There were shouts and whistles, and before these had quite died down I made my way toward the front. “Fighting imperialism is a national, moral, and religious duty,” he began, speaking through a bullhorn. “All those who can contribute to Iran’s independence and do not are part of the plot against our country,” he declared. “There is no compromise or middle ground in this struggle.” He was repeatedly interrupted by people shouting out their assent, and he fought to be heard over their cries. I stood listening for a while, but eventually people began to shove and jostle one another, and all the shouting made it impossible to hear anything more. I shouldered my way through the crowd and crossed the street. My bag was heavy with books, and I stopped on a corner to switch it to my other arm while I fumbled inside for my keys. When I looked back up, I saw that several cars had stopped alongside the university gates. A dozen men were clambering onto the sidewalk and running toward the protesters, their guns drawn. With the first shot, my heart gave a kick. Later, everyone reported screams, but I remember there was a long silence before the chaos started. For a moment I stood transfixed by fear, and then I felt myself snap and tingle with life. I tore into an alleyway, my bag thumping against my thigh as I ran. I was nearly to my car when the earth cracked and threw me to the ground. The world went silent. When I opened my eyes the air was thick with smoke. From somewhere behind me I heard the sudden rattle of machine-gun fire, followed by panicked shouting. I had to get back to my car; somehow I had to find it. I sprang to my feet and started running again. I’d lost my bag by then, but I’d managed to hold on to my keys. When, finally, I found the street where I’d parked, I hurled myself inside the car and sat gripping the steering wheel, desperate to catch my breath. My wrist was bleeding, but the sensation was far from me, like something I’d left behind in the streets. I peered over the dashboard for signs of life. Nothing. A minute passed and then I heard shouting and the hard pop of a pistol. I glanced in the rearview mirror and saw them—dozens of men running in the street, the scream of sirens at their backs. I started the engine and nosed the car forward, but then there was a hammering against the hood and I slammed on the brakes. Three men stood in the street, blocking my way. The one in the middle had a wide, wet circle of blood on his chest, and the two others had each grabbed him under the arms and were half-carrying, half-dragging him toward my car. They looked young—not older than twenty, I guessed. One of them had the beginnings of a beard, and another wore glasses with thick black frames. “Please, miss!” shouted the bespectacled one, rapping against the hood of the car. If I had a moment of doubt it was then, sitting inside my car and staring at the three men from behind the windshield. Who were they? How could I trust them? It was at this point that I might have chosen to do something very different from what I actually did. But I couldn’t see this moment for what it would mean later—for me or for those men. Instead, I shook myself loose from the daze that had stolen over me and pulled the back door open by the latch. They crammed into the back seat, a confusion of arms and legs. Except for their labored breathing and the low, constant moan from the one who’d been shot, they were silent. My hands were shaking, my knuckles bone white as I gripped the steering wheel. Already the air in the car was thick with the tang of sweat. The radio struck up a tune—an airy love song—and I slammed the button off. An afternoon in Tehran, a bright sun in a blue sky, streetcars, ice cream vendors, plane trees, a city busy with other stories. I swung left, then right again and into a main thoroughfare. I had no idea where I should go; my only instinct was to keep driving. It took me a while to work out where I was. It was a relief to fall into traffic, to find myself surrounded by so many other cars and people, and after a few minutes my grip on the wheel loosened, just slightly, and I forced myself to breathe. At Avenue Pahlavi a car swerved in front of mine, coming to a stop at a crooked angle. One door slammed, then two more, and three uniformed figures emerged, their faces in shadow and their batons raised and ready. From Song of a Captive Bird. Used with permission of Ballantine Books. Copyright © 2018 by Jasmin Darznik.